#315 and for the record, it is three a.m. he is not cooking baguettes. he is making meth. monday is too late, we have already won! how is it going today? 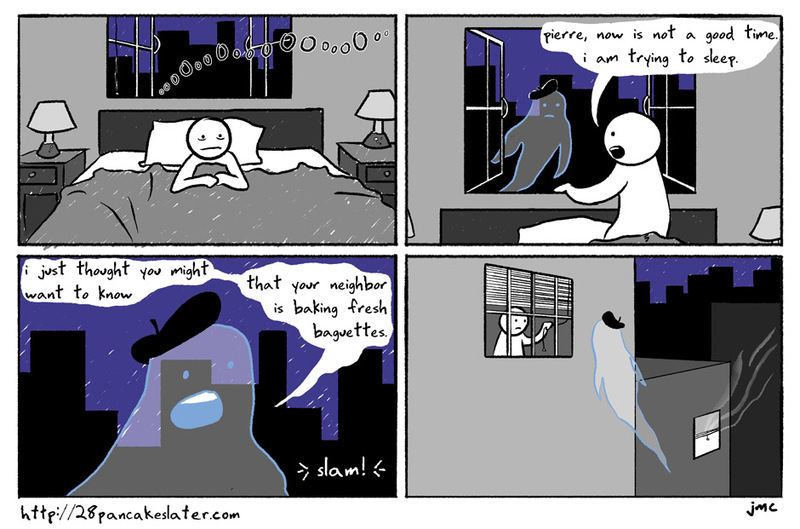 this comic suggests that every place craig moves, there is a ghost living nearby. i find that comforting. i ate a baguette last night. part of one. covered in butter and garlic. it did not inspire this comic. maybe the comic inspired the eating of the garlic bread. one can not be sure of such things, only that a comic was drawn and some bread was eaten, and everybody was happy all the time forever thereafter. anyway, i hope your monday is not lying in wait, ready to pounce on you and tear you to pieces. i sincerely hope it is not.